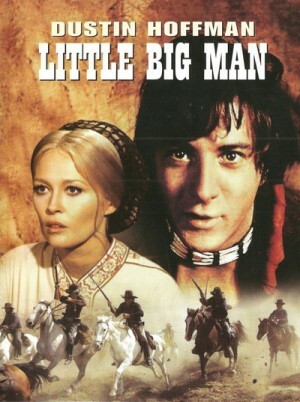 One of the most unconventional westerns ever made. This startling (if occasionally heavy-handed) revisionist tale is recounted in flashback by 121-year-old Jack Crabb (Dustin Hoffman), who claims to be the only survivor of the massacre at the Little Big Horn. As a boy, Jack is taken in by Cheyenne Indians and raised by Old Lodge Skins (Chief Dan George), but later he protests that he is white when his tribe is attacked by the cavalry, beginning a pattern of cultural fence-hopping that dominates the rest of his life. Over the course of a century or so, Jack earns the name Little Big Man for his bravery in battle; is taken in by a preacher and his randy wife (Faye Dunaway); becomes both an assistant to a cure-all-peddling drummer (Martin Balsam) and a less-than-successful gunfighter; nearly dies when Custer (Richard Mulligan) and his troops attack his tribe at the Washita River; turns to alcohol; and guides the Seventh Cavalry into the Little Big Horn massacre.